Even some military aficionados would be surprised to know that the Navy has dedicated special operations helicopters squadrons. The Air Force's Pave Hawk and Osprey communities and the Army's notorious Night Stalkers take up much of the limelight. But now, the Navy's two reclusive squadrons are set to stand down due to a budget crunch. The HSC-84 "Redwolves" and HSC-85 "Firehawks," are both part of the shrinking band of U.S. Naval Reserve aviation units. HSC-84 in particular can trace its roots back to the famous Huey gunship flying Light Attack Helicopter Squadron Three (HAL-3) "Seawolves," which heroically provided special operations airlift and fire support during the Vietnam War. Currently these two squadrons alone, HSC-84 located on the east coast at NAS Norfolk in Virginia and HSC-85 located at NAS North Island, California, make up the entire contingent of dedicated US Navy special operations helicopter support capability. With specialized gear and training, both of these squadrons are masters at special forces insertions and extractions, along with the critical combat search and rescue (CSAR) mission. Beyond that, they can also provide more rudimentary capability when tasked, such as support for counter-insurgency operations, counter-WMD missions, basic logistical transport, armed over-watch and vertical replenishment, but seeing how busy these two high-demand units are, they rarely go about such tasks. Part of the issue is that the Navy, the Joint Special Operations Command and the other services squabble over who should foot the bill for dedicated special operations support squadrons that fly operators from all the services, not just Navy SEALs in this case. Just a couple of years ago, with both wars supposedly winding down, and the Navy under a hard fiscal pinch, getting rid of their only special operations squadrons and migrating the mission to fleet MH-60 Sea Hawk squadrons was a very enticing, albeit possibly an unrealistic, prospect. Still, many would say that the HH-60H Rescue Hawk's unique capabilities and especially their crew's specialized training, makes the mission nearly impossible for fleet pilots to assume at anywhere near the same quality as their highly experienced and special operations focused Naval Reserve counterparts. In fact, fleet MH-60 crews already have so many missions to train for that it is questionable as to how good they can be at any one of them, this is before the possibility of stacking the demanding special operations mission on top. As a result, there is little doubt that by pushing the special operations mission off onto fleet crews, the Navy and Special Operations Command is assuming much greater risk when compared to sticking with specialized units to provide this capability. The cost of the HH-60s vs the fleet's newer MH-60s is also an issue, with the older and specialized HH-60s costing close to double per hour to operate over their more modern MH-60 counterparts. Then there is the issue of who "owns" the squadrons and thus who can dictate their schedule. HSC-84 and HSC-85 are owned by Special Operations Command and Naval Special Warfare Command so their tasking is focused accordingly. If the Navy were to move the special operations mission to fleet MH-60 units, fighting with the myriad of other 'customers' that also utilize the MH-60s will undoubtedly be an issue, especially considering how time sensitive special operations missions can be. The Navy's push to unload their dedicated special warfare helicopter support units all together is an interesting one. Although these squadrons do not exclusively fly US Navy SEALs they work with them very closely and over the last few decades Naval Special Warfare has been fairly flush with money. Exotic vessels and technologies have been financed regularly and the SEALs semi-dedicated boat service, the SWCCs, remains a financially healthy facilitator for the SEALs and other special operations units. So how is the Navy's similar special warfare helicopter service any different? The answer may be found in the fact that 'jointness' has become so ingrained in the special operations aviation community that it may end up working against HSC-84 and HSC-85 in the long run. Special Operations Command's (SOCOM) air support component has become widely 'platform and service agnostic,' with SEALs flying on Army choppers regularly and Delta Force doing the same on Navy choppers. Still, losing these two highly trained Naval Reserve Squadrons will not only decrease America's overall dedicated spec ops air support capacity, but if fleet units are to really assume this highly demanding role on top of all their other missions it leaves the quality of the crews and their gear that the they will provide for such demanding missions up for debate. Under such a scheme, the Navy's diffused special operations helicopter support apparatus will most likely become a 'lower tier' capability, and will be passed over by SOCOM for anything but the lowest threat combat scenarios or simple training missions. According to the Navy Times, the 160th SOAR Night Stalkers, along with their HSC-84 and HSC-85 counterparts, make up about 70% of the spec ops airlift missions around the globe, and about 30% of the training missions here at home. Maybe one alternative would be to only use fleet assets for special operations training and add funding to the 160th SOAR to help lessen the blow of losing HSC-84 and HSC-85. But still, this would mean the Navy will be out of the front-line special operations helicopter mission for good, yet this may be better than relying on crews with questionable training and gear for such a demanding mission set. Another idea would be to shutter HSC-84 and HSC-85 and have Navy crews, along with funding, be integrated into the 160th SOAR. This is a similar concept as what happened when the USAF gave up their EF-111 Ravens along with the fast-jet electronic warfare mission in the 1990s. Today, a small portion of the VAQ community (Navy's EA-6B/EA-18G community) is made up of USAF personnel who are concentrated more on land-based expeditionary operations. An opposite concept could possibly work in this case, where a portion of the 160th SOAR are Navy personnel that focus more on maritime operations. How a highly elite and storied unit like the 160th SOAR would take to becoming a Navy half-breed is a whole other issue though. In all honesty, considering that we remain in an expanding battle against a new form of brutal terrorism, one where special operations assets have never been more important as large conventional forces have vacated the battlefields of Iraq and Afghanistan, paying to retain both of these squadrons should probably be a priority for the US Navy and the DoD as a whole. Sure, HSC-84 and HSC-85s helicopters may cost more to operate per hour than newer models but that is not the squadron's nor the missions' fault, it is the Navy's fault for not updating their gear sooner. 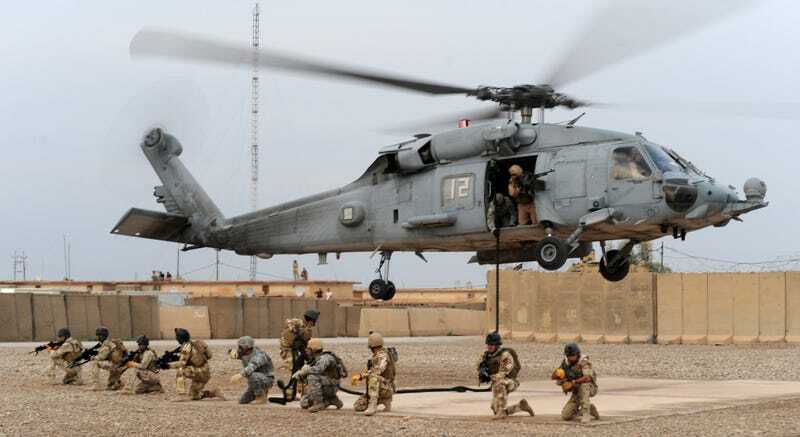 Considering these helicopters are already owned, they would have to accrue roughly 10,000 hours at their higher operating cost each to total the purchase price of a $20M new MH-60 alternative anyway. Once again, with ISIS on the rise around Middle East and Africa, the DoD seems in denial of the realities of the "low-end" war it is in while desperately wanting to pour funds into a more glamorous peer-state conflict of the future. In the end, adding more training to an already over tasked fleet multi-role helicopter units, and diffusing a critical and unforgiving mission set among a much less trained but more voluminous force sounds like a very bad idea. As a result, the Navy would be smart to keep this unique and not easily replaced capability and find the savings they seek somewhere else. Let's be honest, if the Navy were to cut the procurement of one F-35C squadron and buy Super Hornets in their place, they could very likely fund both of these special operations squadrons for decades to come. With this in mind, the actual hard questions that the DoD needs to be asking itself relates to which of these capabilities is more likely to make a bigger impact on America's national security? I think arguing that buying a few more F-35Cs instead of just offering stabilized funding to an already established pocket fleet of highly trained and battle hardened special operations helicopters and crews would be a very hard sell to any logical person who watches the news on a daily basis. There are many places for the Navy to find savings, especially when it comes to procurement, and the F-35C is just one example out of many. But the continued sacrifice of proven and highly relevant capabilities when it comes to the dire fight we are currently in today, not a fantastical fight we could potentially be in decades in the future, is not the way to go about doing it. The Pentagon needs to learn to balance its techno-lust for future wartime applications against the active battlefield we are on today. Just like keeping the already paid for A-10 Warthog and providing it with plentiful funding to go after ISIS, keeping HSC-84 and HSC-85 flying should be part of this rationalization. Then again these are relatively small units that operate in the shadows, they don't make the news and they are not making any defense contractors rich, nor are they gaining big votes back home in the Representatives Congressional Districts or in Senators states. So who is looking out for them no matter how important they are or how much value they provide? It seems like next to nobody and that is a symptom of a much larger disease in itself.